It is not every time that you see Aunty Linda as she is fondly called showing something hot about herself on social media. Linda Ikeji who is 37 has wowed social media users with lovely photos of herself as shared on Instagram. 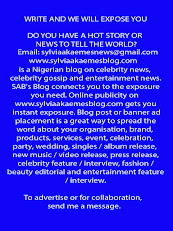 The famous blogger is presently engaged to an unnamed man who has been described as an old time lover. She posted the cleavage bearing photos with the caption; "One of the things preventing us from happiness is observing others and wishing we were in their shoes. No one's life is all perfect, trust me. Just live your life and do the very best you can."